DiEM25: ten years to save Europe? Precarious Europe was in Berlin for the launch of Democracy in Europe Movement 2025, kicked off by former Greek finance minister Yanis Varoufakis. 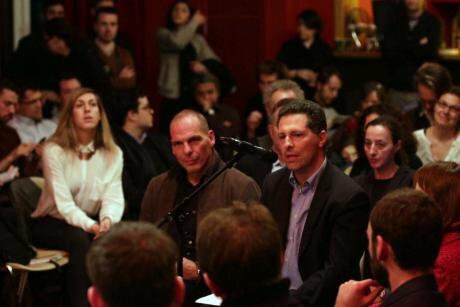 In Berlin, in the Volksbühne theater, Yanis Varoufakis alongside academics, activists and politicians from all over Europe announced the beginning of DiEM25. Volksbuhne.DiEM2016.session3.With a busy schedule that included several interviews and talks around the subject, notably the Talk Real debate he participated in the day before, the ex-finance minister of Greece became the face – but not the leader – of a new movement that is aiming to reform Europe. But with Schengen in question, Britain threatening departure, and possible further European involvement in the war in Syria in the next few months, the clock is ticking. Could 2025 be too late?